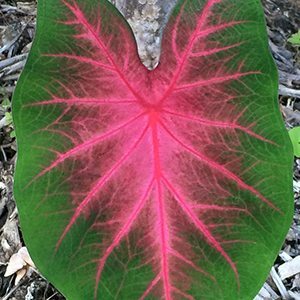 Also known as ‘Elephant Ear’ caladium plants are now hybridised to provide a great range of colorful foliage plants, great for the glasshouse, to grow indoors or for tropical climates. The heart shaped leaves with striking patterns are much sought after. They are grown the colourful foliage, large heart shaped leaves with colour combinations or green, red, pink and white. These are a perennial tuber, they will die right back to the ground in winter and require a tropical to sub tropical climate to thrive. They can be grown in cooler areas however they will to have a warm micro climate created for them to survive. They are naturally an understory plant and grow well in dappled shade. The foliage grows on stems which shoot from the tuber. A humus rich moist and well drained soil is required. All Caladiums are best grown in dappled shade, they can also be grown indoors. They will flower from spring through to summer depending on the climate zone. So from late September through to April, they put on a good show in tropical areas. In cooler areas, flowering period will be shorter and they must be protected from frosts. Grown mainly for their foliage, huge multi colored heart shaped leaves to nearly 1/2m, Caladiums are a tropical plant so in cooler areas these need to grown indoors or in a glasshouse. Protection from full sun is required, however deep shade may restrict color development. Warm moist position is best. Caladiums are frost sensitive, and require regular application of fertilizer. Common Name – Elephants ears or simply Caladium.